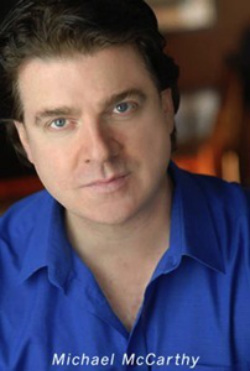 Michael McCarthy made an incredible impact internationally with his critically acclaimed and powerful portrayal of Inspector Javert in the RSC musical production of Les Misérables. From London's West End to Broadway, San Francisco, Sydney, Melbourne, Shanghai, Dublin, Edinburgh and many other cities around the world, Michael performed in over 5000 performances of Les Misérables working with directors Trevor Nunn, John Caird, Ken Caswell, and James Powell. Michael has performed notable concerts of Les Misérables at Windsor Castle (conducted by Nick Davies) for HRH Queen Elizabeth II, PM Tony Blair and French President Chirac at the Royal Albert Hall (conducted by David Abel), and in numerous concert arenas throughout Europe with the Royal Philharmonic Orchestra. Michael was delighted to join the RTE Concert Orchestra in celebrating its 70th birthday in May under the baton of one of Irelands foremost conductors, Proinnsias O'Duinn. For Gothenburg Opera, Michael took on the role of Sweeney in Stephen Sondheim’s Sweeney Todd – The Demon Barber of Fleet Street to rave reviews (conducted by Martin Yates, directed by Staffan Aspegren). Other top roles include the Phantom in Ken Hill's Phantom of the Opera (Theatre Royal/UK), and Chess in both Norway and Sweden. Currently Michael is working as a music production consultant in the USA as well as his continual recording and production work through his own recording studio in the States. Michael’s solo CD’s, Broadway, Living for the Moment, and You’re Still You, as well as other recordings and DVDs featuring Michael are available on iTunes, Amazon and CD Baby. As Executive Producer he established performing arts academies at five star resorts in the Caribbean producing live concert performances and providing coaching opportunities for guests by other top professionals from Broadway and the West End. In Ireland, Michael is the founder of Performing Arts Summer School at the Cork School of Music. Other concert appearances have been with the Royal Philharmonic Orchestra, RTE Concert Orchestra, BBC Concert Orchestra, Jersey Symphony Orchestra, Ulster Orchestra, Stockholm Sinfonietta, Cork Youth Orchestra, and previous concerts of The Music of Andrew Lloyd Webber. Born in Cork, Ireland, Michael began his professional career at the age of 15 performing leading roles at the Cork Opera House. Having studied classical piano from a younger age, he went on to receive his A.L.A.M. diploma with honours from The London Academy of Music and Dramatic Arts. Michael performed with the Montfort Singers in Cork and also taught on the staff of the Montfort College of Performing Arts. He then received a full scholarship to Stephens College in the United States where he attained a Bachelor of Fine Arts degree in Theatre. He is a proud survivor of the professional Okoboji Summer Theatre, one of America's oldest summer stock theatres, performing 9 major productions in 10 weeks! Theatre: Inspector Javert in Les Miserables (London, New York, San Francisco, Shanghai, Sydney, Melbourne, Dublin, Edinburgh, Manchester, Plymouth, Birmingham, Copenhagen, Stockholm, Gothenburg, Helsinki, and Oslo. For the Tenth Anniversary production in Australia he received a nomination for Best Male Artist), Sweeney Todd in Sweeney Todd - The Demon Barber of Fleet Street, with the Gothenburg Orchestra (Gothenburg Opera House for West End International), The Phantom in Ken Hill's The Phantom of the Opera (UK tour/London), Molokov in CHESS - The Musical (Norway & Sweden), Sky Masterson in Guys and Dolls (Key West Pops Orchestra/Key West, USA), Thomas Inkle in Inkle & Yarico (Washington DC/Berlin/Edinburgh and filmed in Barbados by PBS/USA), The Red Shadow in The Desert Song (Ireland), Dr. Akizuki in Out of The Blue (West End, London), Marco in A View From The Bridge (Edinburgh/USA), Count Carl Magnus in A Little Night Music (USA), Sir Lancelot in Camelot (Cork Opera House, Ireland), Dominique in The Baker's Wife (USA), The Officer in Brendan Behan's The Hostage (USA), Patrick Dennis in Mame (Cork Opera House, Ireland), Tom Trainer in No No Nannette (Ireland), Tom in Brigadoon (USA), Max in Cabaret (USA), Cole Porter (biographical revue/USA), Rigoletto (Ireland), Duke in Twelfth Night (USA), Mr. Loveday in London Cuckolds, Harry McMichael in Not Now Darling, Leonard in Pajama Tops, Laurey in Little Women, Love From Judy and Eugene O'Neill's Ah Wilderness (USA). Washington DC where Michael performed for members of the White House. abolition of the slave trade for PBS television, USA. Michael is a supporter of the Christina Noble Foundation giving children around the world the right to have dreams.